Like most of us, I remember spending time listening to stories of my parents’ childhood experiences. Both my parents were born less than a decade after the turn of the 20th Century, so when they began to tell about their early years, it was like getting a history lesson. My father’s parents were farmers, as were the majority of Americans at the time. They lived in eastern Oklahoma. 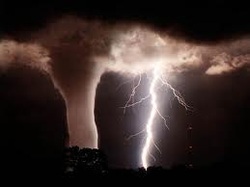 In that part of the country, the weather phenomenon known as the tornado was all too common. Swirling winds of high velocity can destroy lives and property in mere seconds. In those days, there was neither television nor doppler radar to let you know when a twister was coming. Dad and his 2 brothers were playing outside one day when their parents saw a storm coming. Their mother grabbed a quilt from the house and ran outside to get the children. She scooped up George, my dad’s older brother, and his father got Clyde, the younger brother, and began running toward the house. Since he “didn’t have any more parents,” my father ran along behind his mother. But the winds were already getting strong. Suddenly, my dad realized he wasn’t on the ground anymore. The wind had picked him up; his legs were rocking from the knees down. He had no control over his movements. He was blown toward the wooden rail fence that was nearest the house. Mercifully, the fence stopped him, but he still couldn’t get his feet on the ground. By this time, his mother realized that her middle son was no longer behind her. When she looked and saw him by the fence, she shouted above the noise of the raging wind for her husband to get George into the house. With the quilt around her, she ran from the steps of their house to the fence where my father was dangling in the air. It was too late to get back to the house; the tornado was upon them. My grandmother wrapped the quilt around herself and my father. She then wriggled beneath the bottom rail of the fence and trusted the good Lord that the storm would not rip the fence out of the ground. The fence held, and they rode out the storm together. Grandmother was in her 20’s when this incident occurred. She was a Godly woman who prayed every day, not just in emergencies. The Lord rescued her and my father, I believe, because she feared Him. As the years went by, my grandparents had six more children, all girls. Of those nine siblings, my father was the first to live to the age of 90. God is faithful to those who fear Him and choose righteousness. In late December or early January, I look to the Lord to see what He would show me about the coming year. This year I have waited for confirmation for the words I have received, and they have come. Our brother Jonathan Cahn, author of the very popular book, The Harbinger, spoke out about the darkness getting darker and the light becoming lighter. This is exactly what the Lord showed me will happen in the coming year. Darkness shall cover the earth. This kind of darkness signifies misery, destruction, death, ignorance, sorrow, and wickedness. This is the same darkness mentioned in Isaiah 9:2 and in Matthew 4:16. Of course, we see the evidence all around us and it is indeed becoming darker. People are in darkness and gloom. The King James Version calls it "gross darkness." But darkness makes the light easier to see. In the verses above, the Lord tells us to arise, that is, to rouse and strengthen ourselves, and to be luminous as the break of day. We are to let Him set us on fire for Him. Then we will burn brightly like luminaries in the sky in the midst of even the greatest darkness. This is because the Lord will arise over us. The Hebrew word for "arise" is "zarach," which means to irradiate or shoot forth beams as the sun when it rises. As we allow Him to do this, His glory (splendor) will be seen upon us. This is what will draw the unbelievers, those who desperately need to know Him. How do we arise and shine? By daily taking heed to His Word. As the world around us gets darker, as the news reports tell us of increasing wickedness, let us be lights guiding the lost to Jesus. This morning, I was praying in the Holy Spirit and praising the Lord. After several minutes, I began to pray in English, "Lord, break up the fallow ground." This was for the area we are in, the Avila Mountains, as well as for the city of Carayaca. 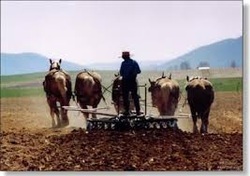 The Holy Spirit began to show me a vision of a plow making furrows in dry ground. It came to a stop against a rock and could not seem to go any further. The rock was not very big, about 4 inches or so thick and as wide as a man's hand. The color of the rock was a light tan, rather dull and boring. It was very smooth and I recognized this as showing that this particular obstacle had been here for a long time. As I continued to pray in the Spirit, the plow kept bumping against the rock and moving no farther. I began to pray for the Lord to remove the rock. The word "complacency" came to me. Apparently, this was the evil spirit that is keeping the Christians in the area from serving God with all their hearts. I began to bind that spirit along with others such as sloth and lethargy. I asked the Father to touch the hearts of His people so they would stop putting Him last and begin to seek Him first. As most of you are fully aware, we are living in extremely difficult times (see 2 Tim. 3:1). However, this should not make us draw back (see Heb. 10:37-39), but actually propel us to do even more exploits for the Lord (see Dan. 11:32) as we listen to God's voice and believe that what He instructs us to do will cause us to bear much fruit for the Kingdom of God. The war is on whether we acknowledge it or not. God doesn't want us to be like the ostrich who sticks his head in the sand not realizing that his whole body is exposed. He may be in denial, but everyone else realizes he is uncovered and unprotected. I believe we are indeed living in the last days, and God wants to encourage us that if we walk in the Holy Spirit, we will indeed be recession-proof. What does it mean to be recession-proof? Well, it simply means that those who are being led (present tense) by the Spirit are the Sons of God (see Rom. 8:14) and do not yield to the lust of the eyes, the pride of life, or the lust of the flesh (see 1 John 2:16). We are children of God by virtue of the new birth, but we are not operating as sons of God unless we are walking in the Spirit, hence we are recession-proof because we march to the beat of a different drummer. We cannot walk in the Spirit if we do not listen to the voice of God and obey what He instructs us to do. God is for us and if he be for us, who can be against us (see Rom. 8:31). However, if we disobey the Lord, we open ourselves up to things that will block the recession-proof path that the Lord has out laid out for us to walk on (see Prov. 4:18). In Revelations 3:20, the Lord is standing at the door of our hearts and knocking. We not only need to hear his voice, but we must open the door. In other words, we must obey and act upon what He instructs us to do. Then we will indeed be recession-proof because we are walking in the Spirit and not fulfilling the lusts of the flesh. The Lord showed me a small 40's style house that seemed completely brand new. All of the windows and doors were open letting the sunlight (the Lord's Light) in and letting the wind (Holy Spirit) blow through. The Lord told me the house represented America. Then I saw people on the inside and outside of the house boarding up all of the windows and doors completely blocking out the light and wind. The house was completely dark inside and slowly began to rot away. The floor rotted out leaving a bare soil floor and the walls began to deteriorate and form cracks that allowed for small rays of light to shine through onto the soil floor. As the house continued to rot, more sunlight was shining through. The light was causing new growth on the floor in the form of little seedlings that were growing as their own strand (representing the individual saints of America) but the strands all began to twist together as they grew forming a giant, thick stem which formed its own bulb on the end (the unity of the Church). The newly formed stem burst through the roof of the house (America) causing the house to collapse. The new bulb then bloomed to an enormous and beautiful flower which then burst into a magnificent tree many times larger than the flower and house. The tree began raining down all types of fruit (life and abundance) that supplied all the needs of the people and the people then began to take the infinite excess of fruit to all the nations of the world. The Lord showed me there is a rebirthing of the purpose of America and His people to finally do what they have been called to do. For those in the body of Christ who have been faithful, God is going to rapidly answer their prayers. The Lord desires to make Himself known in unusual ways to the lost and dying. Get ready for God to use you powerfully in demonstrations of the power of the Spirit! 2013. I heard something on the number 13 here recently. I heard someone say that 13 is usually used in a negative term that it means rebellion, division etc. etc. but in the article I was reading this person said that it also means double blessing!! Now this was a new concept for me looking at the number 13 in this way. But it made sense to me especially after all the things the Lord had been speaking to me. It fits! So I just want to declare to you today that 2013 is not a negative year even with all the challenges we face as the body of Christ and as Americans. It is not a bad year for the Church! This is the year of RESTORATION AND DOUBLE BLESSINGS being heaped on the body of Christ. The Lord has been talking to me about Job here lately and I want to share what He has shown me. waiting for something (I could see the glory cloud of God swirling around and I could see the light of God shining through) someone who worked for the gas station came to where I was and asked me "Are you Jessica Wilson?" I was just like "Yes I am Jessica Wilson" and this person said "Well Jessica you have just won the $2,000,000 lottery jackpot!" I just stood there. I was thinking how could this be? I never buy lottery tickets or anything like that. It must be a mistake; I didn't buy any lottery tickets! Well as I am thinking about this the man pulls out a receipt and shows it to me and said "You are Jessica Wilson who lives at such and such address?" I looked at it and this receipt had ALL of my personal information on it already!!! I was like "Yup that is me, but how is this possible that I won the jackpot when I never bought a lottery ticket?" He said, "I don't know Ma’am all I do know is that your information was found and picked in the system and you are the winner of the 2 million dollar jackpot!" At this point in the dream I saw in the glory cloud explosions going off like fireworks!! I heard people yelling and cheering and celebrating our Great God! I was praying and asking the Lord what all this meant and that’s when the Lord started speaking to me about Job and how when Job repented like in verses 5 and 6, “I have heard of You by the hearing of the ear, but now my eye sees You. 6 Therefore I abhor myself, and repent in dust and ashes.” After Job repented then God blessed Job and paid him back double of what had been taken from him IN EVERY SINGLE AREA!!! Everything about 2013 emanates of increased, fresh grace from heaven, restoration, answers to prayers we have been waiting for, and double blessings being poured out!!! So much so we won't be able to contain it all! So get ready Sons and Daughters of the Most High God! Get ready for the heavens to open over you FULLY and get ready to do great exploits for the Kingdom of God! Last Thursday night at our prophetic school, Jessica, shared a great message along with her personal testimony in regards to the absolutely marvelous grace of God poured out on her the last couple of years and to all who will receive it. If you would like to have a copy of this message click this link and send us your mailing info. After the teaching session and Q&A session, we normally have prophetic activation. These are always designed to stretch the students by looking and listening to the Holy Spirit for a word of personal prophecy. Standing up before the class, I had no idea what the Lord wanted me to do in regard to this. God is always faithful and has many pleasant surprises for us. I heard my cell phone buzz quietly in my pocket, but didn't pay any attention to it as I don't normally take calls when I am in the middle of a meeting. However, after it buzzed a second time and I saw that it was a call from my youngest daughter, I answered, telling her by the prompting of the Holy Spirit that we were getting ready to do prophetic activation and we would like to minister to her prophetically over the phone. This was definitely a divine appointment. I then asked the students to look to the Lord Jesus for a word for my daughter. Almost every one of the students had a powerful prophetic word or a vision for my daughter and gave it to her over my cell phone. It was really an awesome evening of ministry. This is an hour when the Lord wants to use different methods to minister to people. Be prepared and seize the opportunity. Love never fails. How many times do we hear that in church? Now how many of us actually understand what that means that love never fails? Simply it means this: “God is not a man, that He should lie, Nor a son of man, that He should repent. Has He said, and will He not do? Or has He spoken, and will He not make it good? (Numbers 23:19). It also means this: For when God made a promise to Abraham, because He could swear by no one greater, He swore by Himself, 14 saying, “Surely blessing I will bless you, and multiplying I will multiply you.” 15 And so, after he had patiently endured, he obtained the promise. 16 For men indeed swear by the greater, and an oath for confirmation is for them an end of all dispute. 17 Thus God, determining to show more abundantly to the heirs of promise the immutability of His counsel, confirmed it by an oath, 18 that by two immutable things, in which it is impossible for God to lie, we might have strong consolation, who have fled for refuge to lay hold of the hope set before us. Right now is a time of great breakthrough and moving forward in the things of God for the Body of Christ. But in order to get the breakthrough we so desire we must die to our flesh. This is sometimes a painful process that feels drawn out and never ending, but let me assure you God's Word is true. He does not lie and He does not forget about the things that we have asked HIm for. In fact the scripture says He delights in the details of our lives...that is as personal as He can get to delight even in the itty bitty details...that is an amazing God! So for those of you who seem to be waiting and waiting and waiting and you feel like you're going nowhere? Trust me God is still moving and breathing and sitting on the throne. He knows your needs and He has already met them despite what it may look, sound, or feel like. Just praise Jesus! Praise the King of Kings for bringing every promise to pass and for being faithful! Feed on His faithfulness...Psalm says Trust in the Lord, and do good; Dwell in the land, and feed on His faithfulness. 4 Delight yourself also in the Lord, And He shall give you the desires of your heart. So whatever you do....don't give up!!! Rejoice in the Lord today!!! Joe Schrader is a prophetic equipper that longs to see the body of Christ come into unity and see the nations reached for Christ!